These healthy and flavorful Creamy Mango Lassi Overnight Oats make for one delicious and filling gluten-free breakfast reminiscent of the famous Indian beverage. Firstly, let me just establish the fact that this overnight oatmeal is ridiculously delicious (because it is). With an incredibly creamy texture, and a flavor perfectly reminiscent of the beloved mango lassi Indian yogurt drink, this nutritious breakfast will both nourish and refresh. If you are looking to transport your taste buds to an exotic wonderland, and soak up a hearty bowl of health -- this is it! In a bowl or jar (with lid), combine oats, yogurt, milk, maple syrup, vanilla & cardamom. 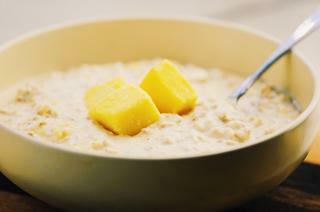 Shake or stir thoroughly to combine.In a blender or food processor, add chopped mango & blend until pureed.Add pureed mango to your oatmeal mix, and stir until evenly combined.Cover your oats & place in the refrigerator overnight.Remove from fridge & top with diced mango before serving.Enjoy!